June 13, 2012 Are You Weighed Down by your Stuff? What stuff do you have weighing you down? What do you mean by “stuff”, you ask? I was confronted with the idea of stuff overload in an article published recently in Parade Magazine. 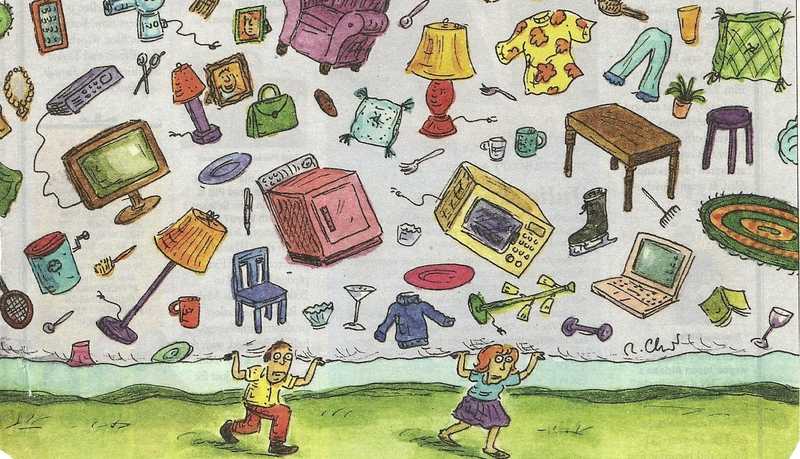 This article, titled “Is Your Stuff Weighing You Down?”, tackled the issue of actual physical clutter—the lamps, mugs, ointments, clothes, supplies, and other objects that fill our closets and our attics. The concept presented in the magazine slowly grew into a larger issue in my mind. It all started the other day with a search for a guitar amp. Now before you get confused, let me assure you that the guitar amp was not for me, it belongs to my son who had returned home in search of a few items. Because my son is in his mid-twenties, he’s been out of the house for some time now. This adds a special challenge to locating his stuff. While he may have remembered what closet he left his amp in, the closet itself had been overrun with miscellaneous piles of my “work stuff”. He opened the closet door and optimistically expected to see his amp. Instead, he faced perilous stacks of my documents, envelopes, gadgets, and more. He returned downstairs to find me in the kitchen. “Mom, what is all that stuff?” he asked. My honest reaction was mutual confusion. “You’re right,” I said, “what is all that stuff? !” I then trudged upstairs to tackle my clutter. As I dealt with the tangible stuff, I started to think about the less tangible stuff that may not fill my closet, but sure fills my mind and weights me down. So now I bring this tough but amazing question to you. What are the sources of guilt, obligation, and responsibility that you feel weighing you down? Are some of these items actually the “stuff” or responsibility of other people that you’ve taken on yourself? If your use of time conflicts with the things you value most, consider rethinking your life balance. If your issue is that you have trouble gracefully declining the requests of others, take a moment to visit my handy list of creative ways to say “no”. I promise you won’t regret it!